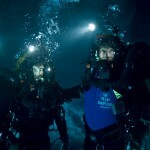 Scheduled for release in February 2011 – and a timely lead-in to OZTeK’11 – the 3D action-thriller Sanctum, from executive producer James Cameron, follows a team of underwater cave divers on a treacherous expedition to the largest, most beautiful and least accessible cave system on Earth. When a tropical storm forces them deep into the caverns, they must fight raging water, deadly terrain and creeping panic as they search for an unknown escape route to the sea. Produced by Andrew Wight – a previous presenter at OZTeK and recipient of the OZTeK “Outstanding Achievement” Award – check out the movie trailer here.